As you’ve heard me say before, I have a couple of skinny jean styles I wear again and again… many of which I have in multiple washes and colors! One of those is the J BRAND Maria I’m wearing here. I actually have this pair now in black, white, a vintage wash and this dark blue wash I wear a lot during the fall. The pair I’m wearing here is one I purchased several years ago, but it remains to this day one of my most-worn pairs in the fall/winter season. They have even more washes here if you want to check out the variety! These jeans are comfortable, flattering and most importantly: they last. They don’t stretch out with wear, and I haven’t had an issue with fading either. I highly recommend these jeans to anyone looking to try a new high-rise skinny style! While these jeans, this jacket and this top are old tried and true staples in my wardrobe, this outfit does feature a new find as well. These trench buckle sandals are such a wonderful neutral and transitional style for Texas weather. While I know it’s something I can wear now and into the fall, I think it’ll be just as useful going into spring once the weather starts to warm right back up. The lower chunky heel provides stability, making them super comfortable even for long periods of time. The best detail on these is the trench buckle ankle strap, don’t you think? I love the gold hardware and the extra stylish touch the trench buckle brings to this simple pair of suede sandals. So chic! 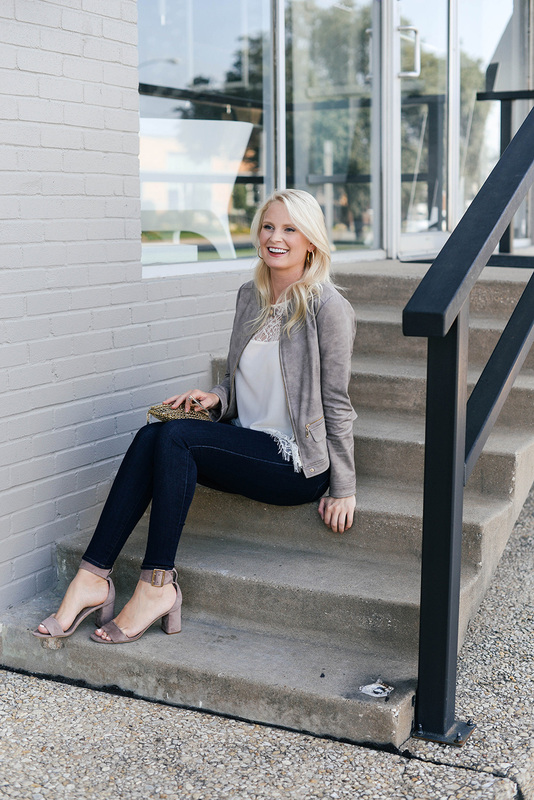 This dolman-sleeve cardigan comes in two great neutrals and is under $90! Such a great wear-to-work topper for a chilly office. Tibi has reinvented the denim skirt into a sophisticated staple for work with this piece. So obsessed! The mule trend is not going anywhere anytime soon. Loving this simple black pair with a neat bow on top! This top is literally perfect for Texas fall. It’s short-sleeved and slightly cropped, ideal for wearing with skirts or high-waisted shorts, but it features velvet accents giving it that seasonable appeal. The trio of velvet bows at the open back is such an adorable detail too. Love! Leather skirts are a great way to feel the fall vibes while the weather is still mild. Love this forest green style from Kate Spade! Fall florals, ruffles and a price tag that’s under $100… what’s not to like about this top? The sleek design and creamy camel color on this tote make it a no brainer in my book. Thinking about getting it for myself! These sandals are so cute, love the big buckle detail. This is a chic transitional outfit! I love the sandals and that jacket!